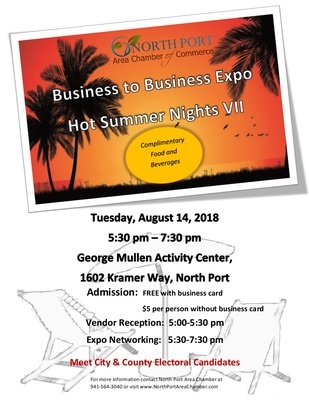 The Business-to-Business Expo is designed to bring the business community together and to provide networking opportunities and a chance to promote your business and establish worthwhile business relationships. There will now be a "Candidate Row" - come on out and meet the City and County Electorial Candidates. Attendees will receive a complimentary “goodie bag”, participate in interactive seminars, network and enjoy complimentary food and beverages. The event is open to all businesses, the cost is $5.00 per person or FREE admission if you provide a business card at the entrance. This is in place of the August Business After Hours. FREE Admission if you provide a business card at the entrance!